Danni's Dreams: Super fun day!! So much fun and so many goodies!! I'm super excited that with the FREE ink pads I got today it completed my collection! 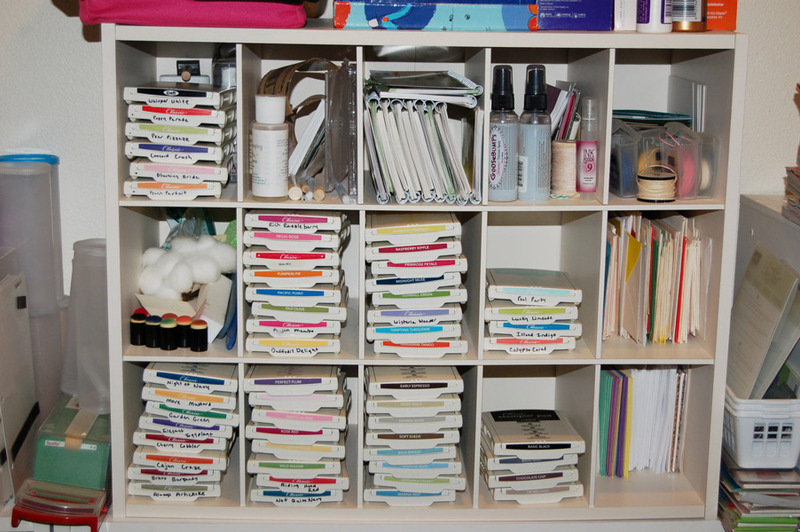 I now have all the ink pads, refills and markers! Yay!! There's still a few days left to get your FREE ink pads too--why not join the SU family! 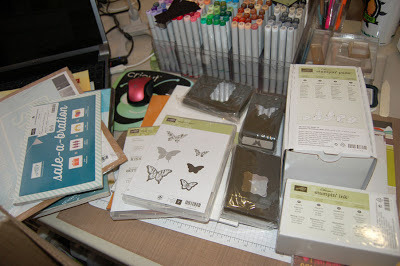 Here's all my pretty ink pads--now I just have to work on getting the caddy to keep them all in! Also wanted to share a quick little thing I do so I can see the colors of my cardstock and ink pads at a glance. 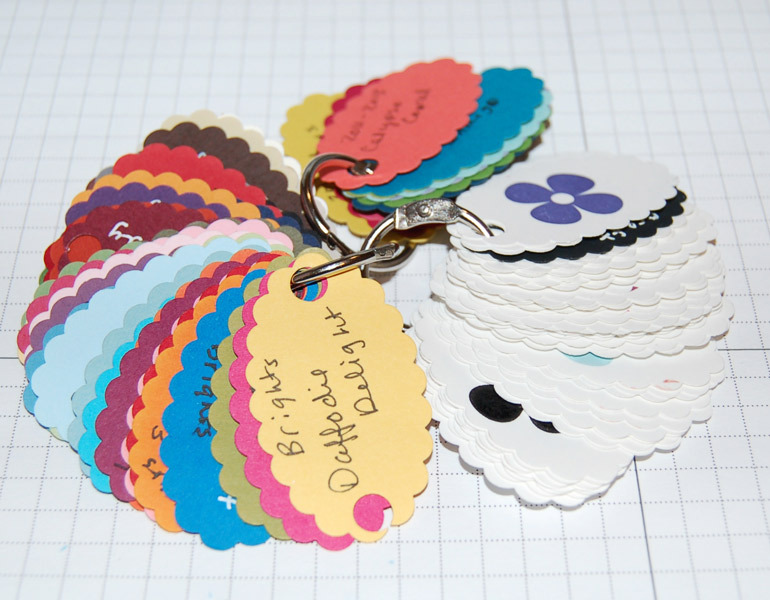 I just use my Scallop Oval punch to punch out some ovals and then I label what color/collection it is on them and then punch a hole in them and put them on a ring. 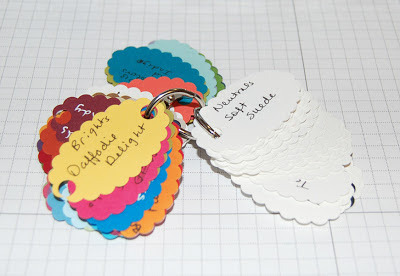 Then when I need to see if my cardstock/ink matches a certain paper, etc. I can just put the oval right up to it and see. For the ink pads I stamp the ink on one side and write the name on the reverse. I'll be back soon with more fun to share! 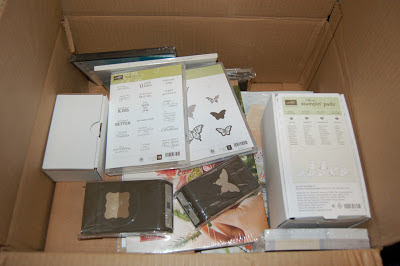 Don't forget you can now order your Stampin' Up supplies from me anytime through my website! I also now have the new Spring Mini Catalog and Sale-a-bration Catalogs so contact me or your SU demo to get them---you're gonna wanna see these!! Lots and lots of awesome products!! oooh, look at all those goodies! have fun with your new venture danni! A fun day indeed! 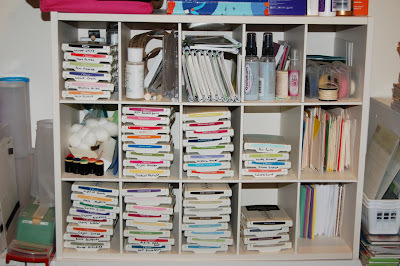 Enjoy organizing and playing with all of your new supplies. The brown man paid you a visit indeed, looks like fun, fun, fun! congrats and good luck! SU is how i got into all this stamping in the first place! A box full of awesomeness. :) Have fun! good look with your new SU! venture Danni! 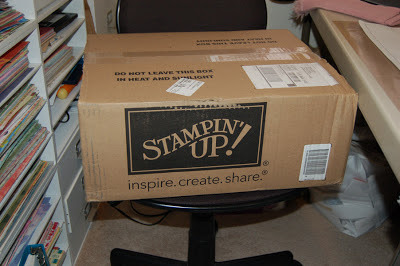 awesome..look at all those fun stampin up goodies..